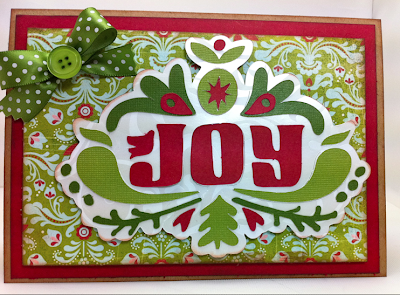 As soon as I saw this cartridge, I knew I had to cut the "Joy" word art! I thought it was just beautiful. 1) Fold a 7" x 10" sheet of craft cardstock in half to form a 5" x 7" card. Ink edges with brown chalk ink. 2) Ink edges of a piece of red cardstock cut at 6-3/4" x 4-3/4" and then adhere to front of kraft card. 3) Cut "Joy" image at 4", all layers with colors as shown. Adhere all pieces together. Lightly ink edges. 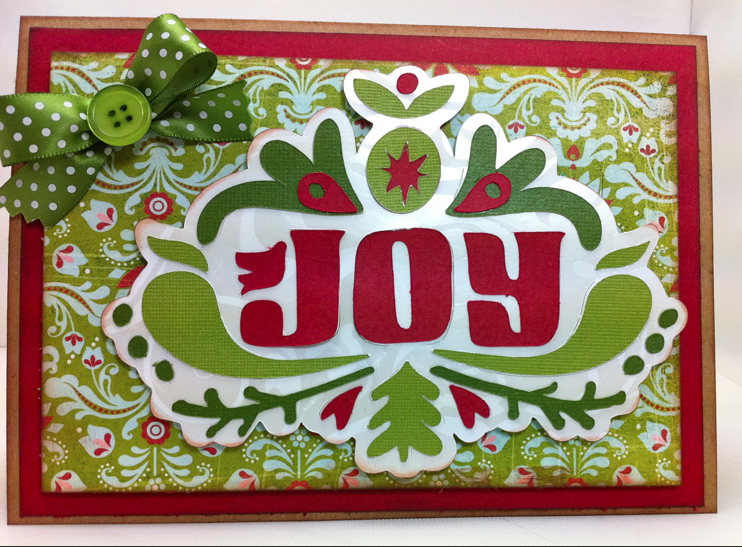 4) Adhere "Joy" to a piece of designer paper cut at 6-1/4" x 4-1/4". Ink edges of designer paper. Add this to card front using pop dots. 5) Ink piece of cream colored cardstock cut at 6-3/4" x 4-3/4" and adhere to inside of card. 6) Using glue dot, adhere button to bow. Adhere bow to card using glue dot, as shown. Products used: Cricut Scandinavian Christmas Cards cartridge, Basic Grey paper, Core'dinations cardstock, button and ribbon from Papertrey Ink. Cricut Girl's Makeup Party Cartridge! 1) Leave a comment telling me your favorite fall soup. Mine is taco bean soup (recipe to come tomorrow!). Winner announced next Monday, September 26, 2011. Last week's winner will be announced later today - I have to zoom out of the house to get kids to school! Check back tomorrow for my festive Fall project - it's why I braved the crowds at Michaels yesterday! I love potato/broccoli /cheese soup. I found a quick easy recipe a few years back and it's become a family favorite. Can't choose just one! Love lobster bisque and cheddar broccoli though I can eat these year around. Getting hungry just thinking about it. Love New England clam chowder. Good way to stay toasty warm. My homemade chicken noodle soup is good anytime of year! My new favorite is Rustic Italian Tortellini Soup! Love the cards thank you for sharing your ideas! 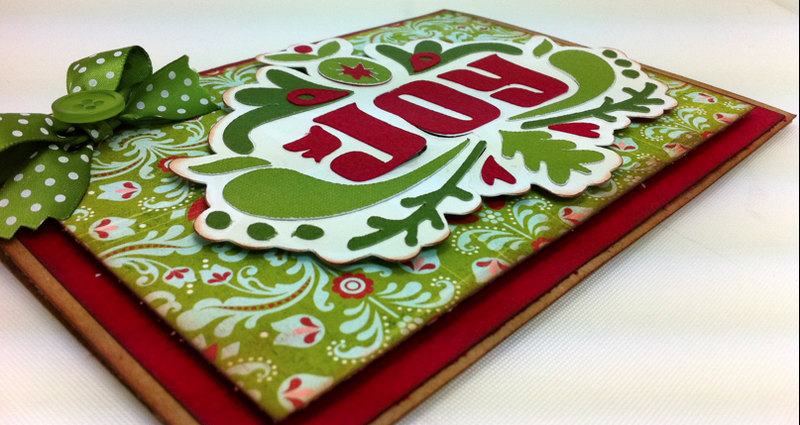 Beautiful "JOY" card, I love this cartridge!!! Thanks so much!! Mine is homemade Chicken Soup with homemade noodles! Wish it would cool down here in Arizona so I could make some! Yum yum! Thanks for the chance to win. I love all kinds of soup-but probably potato corn chowder the best! OH - BEAUTIFUl card!!! I'm starting to really want this cartridge!!! My favorite soup is broccoli cheese, but it has to have homemade biscuits with it to be perfect!!! Gotta have my baked potato soup on a cold winter day! i always love just tomato soup. Beautiful card. I love white chicken chili, black bean soup, and hamburger minestrone. Hmmm...now I'm hungry for soup! Homemade Potato Soup, I have a great recipe for it, my family just loves it! Great card and great name! The only soup I eat is Lipton Chicken Noodle Soup. I make a carrot ginger soup that is delicious - even my "no carrot" kids love it. It freezes well so I can have a bowl whenever I want. First of all - LOVE the card! Secondly, my favorite fall soup is a new recipe for butternut squash cream soup. Talk about comfort food and the color is perfect for fall. I luv luv Potato Soup! I wasn't really into the new Christmas Cartridge, until I saw you Joy Card. You did a beautiful job! My favorite fall soup is actually called Summer Soup. It is made with hamburger as a base and then you add all the garden veggies. It's nummy. I love the card! I don't have that particular cartridge but with improvise. I love your ideas... I can't wait for next Monday to get here!!! My favorite is homemade baked potato soup...mmm! My all-time, make-you-feel-better soup is Chicken Enchilada! YUMMMM. My favorite - hands down - is Slow Cooked Taco Soup. High protein, low fat, great taste, and filling. Thanks for a chance to win the cartridge. I love chili, does that count as a soup. I am not really a soup fan. I am not much of a soup eater but I would have to say Tomatoe soup is my favorite. I failed miserably at my attempts at homemade soup so it would have to be out of a can. LOL. Your card is great! Oh goodness, there are so many! But my favorite has to be Stone Soup that the kids make at school and we all gather to eat together. It's so yummy! As always, thanks for the inspiration! I love all soups!! They are lite and easy on the tummy. But chicken is the best. Thank you for a chance at your drawing. Mime has to be Hamburger Soup (Best of Bridge) hands down the best comfort soup. My fav is chili but only my own. My faaaaaavorite soup is Clam Chowdah! Which really isn't a soup but a chowdah! LOL - Hope I win, I've been eyeing this cartridge for a while! Ham & Bean soup! Too bad this cart is out of stock already. Cute card! love the card!! You always to such beautiful details and pick such gorgeous paper, too! My fav soup is Tuscan Chicken with rosemary and Cann. beans. Delicious! May have to fix it tonight sense I am now wanting it!! Beautiful card! I love butternut squash soup!!! I don't know if it counts as a soup, but chili tops my list of fall consumables. My favorite fall soup is Baked Potato Soup! I can't wait for the first pot of the season. I am a subscriber to tyour blog. My favorite fall soup is vegetable soup. So excited for all the holiday card ideas. Thanks for sharing and thanks for the opportunity to win this new project cartridge. I am anxious for your recipe. Sounds like one my family will like. I make a Chicken Tortilla in the crock pot soup that is to die for. Soup weather is coming!! My new favorite soup is butternut squash. I've only had it at restaurants - I guess I need to look for the recipe. I love your JOY Christmas card, and this new cartridge! Cute card! Can't wait to own it. As for soups- Chicken Torilla, Corn Chowder... but my FAVORITE is mexican albondigas soup. SOOOO GOOD and hearty! beautiful card, love it, and my favorite soup chicken noodle. my favorite soup is basic vegetable soup my husband makes - YUM! My daughter is going to be married on Saturday so i don't have time to use the Michael's coupons! boo-hoo! but Yea wedding!! back to work on my favors! My favorite is Turkey Taco Soup. It is so good. Beautiful card. Question though - saw what looked like a Christmas tree shaped card cutout on that cartridge? I lived in Texas for a long time and while there I was introduced to Tortilla soup. It was so good and spicey my nose would run! Now I am in FL and I have learned to make my version and I have to say it is very good. I cant waitt for fall to arrive in FL so it can be cool enough to make some tortilla soup. I love the deep fried tortilla strips I put on top and melted cheese. Thanks for all your great ideas. You are so creative. love the card, can't wait to get this cart. my favorite winter soup, is probably french onion. my is good, but mimi's cafe, is better. I have two - Taco Soup and the 2 bean chili recipe on the back of the BIG Campbell's tomato juice can. I use the whole can and make it more of a soup. Yummy!! Thanks for the chance at winning! Fun and pretty card. My favorite fall soup is minestrone soup made with all the farms fresh ingredients that are so bountiful right now! Yum. My favorite soup is New England Clam Chowder or Cream of Potato. I have just started making soups to freeze for the winter. I am a long time subscriber and wait eagerly for your email so that they will inspire me to make project. thanks. Awesome card! I can't wait to get this cartridge! My favorite soup is minestrone and I make it from scratch only I add more vegetables and potatoes instead of pasta. My family loves it with homemade foccacia bread! Our favorite fall meal! Thanks for your inspiration! Nice card. Ilike broccoli cheese soup. F.U.N. Cute card. I wish I could begin my holiday cards now, but we're moving and my Cricut's in a box somewhere probably on a boat or a truck at the moment. My favorite fall soup is roasted butternut squash soup, served with a dollop of creme fraiche. Thanks for a chance to win! Beautiful card!! I really love split pea soup. I love to make it with the bone left over from a honey baked ham, yummmm!! Gorgeous card. We love Split Pea with Ham soup. Hamburger & barley soup. Nice and hearty for a cool fall day. My favorite winter soup is minestrone. Great card! I like good ole homemade vegetable soup! Thanks for the chance to win. I love Chicken Noodle Soup from scratch....now..I love your Scandinavian Christmas card everything was absolutely perfect about it....and thanks so much for a chance to win Girls Make Up Party cartridge. Would love to win this cartridge! My favorite is Santa Fe soup. At work we have it often. WE each bring ingredient or two and put in the crockpot. Cute card. I am loveing these card idea Mondays. My favorite fall soup?? That's really hard because I make 4 different kinds that my family loves--homemade chicken soup with homemade noodes, homemade onion soup, homemade potato soup or homemade pea soup. Gorgeous card!! I loooove chunky vegetable beef soup, mmmmmmm! Oooh, I love fall soups. But I really love a good bowl of chili, so yummy! Pretty card Joy. I really like the images on this cart, guess I'm going to have to break down and go purchase one. My favorite soup is homemade chicken vegetable. It is my comfort food. Brings back memories of my parents cooking a big pot with all the remaining veggies from the garden b/f the frost killed the plants. Gorgeous card! Love the cheery Christmas theme. My fav fall soup is Southwestern Chicken Enchilada Soup. Nice spices and my whole family likes it! HI again, I 4 got 2 mention I love the recipe card once again you do things above and beyond...you ROCK! Really cute Christmas card. Thanks for the inspiration. My favorite fall soup (as of last year) is a pumpkin soup mix from World Market. You can use it as is or add fresh or canned pumpkin and cream to it. Yummy. Hard to pick just one but I'll choose Chili-yummy. Thanks for the chance to win this cartridge. Lovely card. My favorite soup is homemade vegetable beef soup made with left over beef roast from Sunday dinner and added extras. Yummy. My favorite fall soup is Santa Fe Soup. My favorite fall soup is the White Chicken Chili from Ruby Tuesday's! Warms me up on a fall day and is fairly low calorie! Your card is so "joy"ful. My favorite soup is Chili. I love to make a big pot of it, so that I have lots of left overs. Beautiful card! My favorite fall soup would be Chicken Corn Chowder. Thick & hearty. Simply beautiful and so elegant. Love that new cartridge! Nice card. I like broccoli cheese soup. Love the card! TFS! My favorite fall soup is Taco Soup. I wonder if it's made like your? It is sooo yummy and sooo easy! I'm already a follower! My favorite fall soup is good old beef stew with cornbread on the side. YUM!!! In fact, we're having that for supper tonight! I love the cuts on the Scandinavian cart! I found someone selling one on ebay over the weekend, so I ordered it. It's supposed to come on Thursday or Friday ~ can't wait to get it and play! Your card is very pretty...and the new cart might be one of those 'must haves'. My favorite soup is Panera Bread's cheesy broccoli (in the restaurant or off the shelf...tastes just the same.) I actually had this for lunch 30 minutes ago. 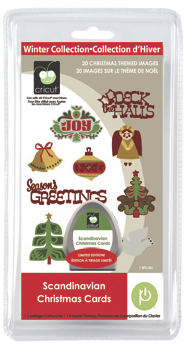 I didn't think that I would care for the Scandinavian Christmas Cards cartridge, but I actually do really like this card that you made! my favorite soup is home made turkey soup with home made noodles. Southwestern Chicken Tortilla Soup is my favorite! Beautiful card! My fall favorite is Butternut Squash. Yummy!! i love hamburger on cold days. My favorite soup is Chicken and wild rice. Really I have two the other is Broccoli cheese. Love the Joy card. My fav soup is just plain vegetable beef, homemade of course. Thanks for the chance to win. Great card. Im not a soup person but I do like chicken soup lol. My favorite soup is brocolli & cheese. My husband and I both are soup fans!! My fav is chicken tortilla, could use a bowl right now to take the chill off!! Soup warms the heart. My favorite is broccoli & cheese although I love must any kind of soup. Loaded Baked Potato Soup. My friend who is an ICU nurse sent me the recipe, along with a comment at the bottom suggesting running to your local hospital for an immediate cardiac cath after eating. Being a nurse, a found her comment hilarious. So hard to choose since there is nothihg like a hot bowl of soup on a damp dreary day. I guess I'd have to say Clam Chowder. A friend gave me her recipe years ago and I make it every winter....yummm! I actually have three favorites! A the top of the list is chicken tortilla, clam chowder, and corn chowder. Can't wait for winter. Cute card! I love potato & cheese soup along with a blanket and a good book. My favorite is creamy tomato basil soup but I haven't found a soup that I don't like! So glad it's getting cooler so we can bring out all that goodness! The card is a JOY! Love the custs on this cartridge. 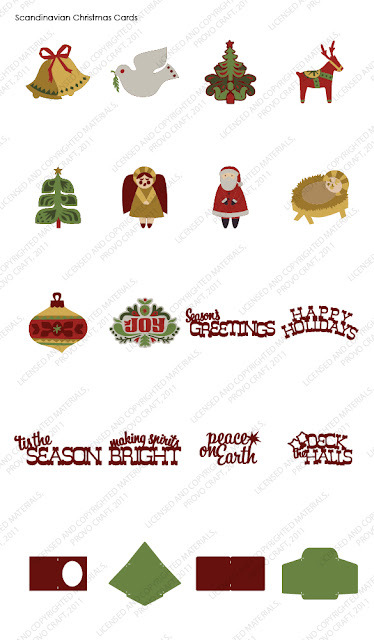 So many of the Chrhistmas paper lines this year are traditional old world in flavor. Cuts will go great with them. We make a scalloped corn soup for fall....love it! Definitely butternut squash soup! I look for it at every restaurant I go to. Should try making it myself sometime. My favourite soup is Aztec Soup...Garlic, chillies,tortilla strips, cilantro. It's the kind of soup that you eat even when you're not hungry.. good thing for me the restaurant is 40 mins away but totally worth the drive !!! 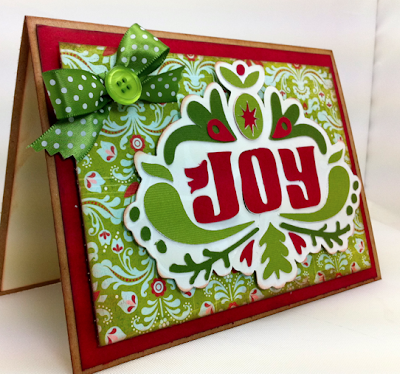 The DP blends so wonderfully with the Joy die cut image. Looks like a match made in heaven. Super card. My favorite fall soup is the stick to your ribs cream of brocolli. We love a nacho soup also. I call it Garden Nacho, because it features lots of bits from my garden (zucchini, tomatoes, onion, peppers). Fall soup - still too hot in here to even think about soup - but it would be my Chicken Tortellini - quick, easy & yummy !!! Our favorite is Taco Soup made with stew meat not hamburger. Can't wait to see your Taco bean soup recipe. Butternut Squash is my favorite! Very pretty card. Chicken and gnocchi soup! The BEST on cool Fall and freezing cold Winter days! Fall and winter are a perfect time to enjoy soup.....my favorite is Baked Potato Soup...yummy!!! My favorite soup is Minestrone. This is a pretty card. Thanks for sharing it and the instructions. What a wonderful christmas card. I love all the colors! Thank you for sharing your creativity with us. I love potato soup and my homemade chicken brown rice soup! That is another thing I really love about autumn, the soups. My favorite Fall soup is Pampered Chef's Potato Soup recipe. 20 minutes with a microwave and it is done and delicious...with home made rolls and home made Iced Tea. I really liked your card. I was wondering if you saw that. I want this cartride a lot. I have a Danish heritage. I can't find it anywhere yet. My favorite fall soup (actually I have 2) is Corn Chowder with plenty of bacon and 2 types of corn, and hamburger barley with tomato and lots of veggies, with corn bread on the side. MMM! makes me hungry just thinking about them. There is nothing like a good bowl of soup on a crisp fall day. I really appreciate you sharing your card, another must have cart. for me. Thank you for the chance to win a great cart. My grand daughters will be delighted should I get lucky. Keeping my fingers crossed. albondigas locas... oh yummy... I need to get a recipe for that one, we go to Sweet tomato to get it! My fav. soup is cream of potato soup with shredded cheese on top. I missed the new releases on thursday,I love your JOY card.My brother has been in ICU for over a week the Doctors said he has ARDS they drain his lungs & they put him out & on a breathing machine to help his lung! Our family favorite winter soup is call Beef and vegetable soup. How I cook it is Beef chuck with all the vegetable you love and a large can of tomato sause and half can of water and some season or green and red pepper cut up you add it all together in a crop pot and let it cook all day. On slow cook so when you come home from work it is ready to eat with cracker or bread. And that is one of our favorite. Of course you had to cut the Joy card! Lovely card! My favorite soup is hamburger soup... quick, easy and oh, so filling! I like the Christmas card you made. Great job!!! Thank you for sharing. I like broccoli cheese soup and clam chowder. Can't make up my mind which one I like better. Thanks for sharing your ideas and talents with us. I love Vegetable Beef and Barley, nothing fancy just plain good. Thanks for sharing all your great ideas. My favorite is potato soup! Yum! Ham Hock and Bean soup is my families favorite. Yummy. Minestrone is my favorite. Yummy. Thanks for the opportunity to win! Looking forward to the recipe too! Vegetable Soup is my favorite on a cool Fall day. Yummy !!! Love your cards and all you do to help us as we make cards and layouts. You are the best. I don't know if it really counts as a soup, but my favorite is chili. It is such a great fall food. fabulous paper choices on your card! Favorite soup is ham & bean soup ~ make from the left overs of a Honey Baked Ham. Smells amazing ~ tastes even better! Cute card! Cannot wait for the recipe tomorrow! My current favorite soup is technically a stew. Its a Chicken Stew. Not a lot goes into it but my favorite part is the fresh chopped basil leaves! YUMMY!! very cute card...thanks so much for sharing...I love New England clam chowder but I also enjoy Chicken Tortilla Soup. Great card!!! Simple and elegant!!! Really beautiful!! Love the paper choice! Love the card!! It's so festive!! I love that JOY card! It's really pretty. HAve a taco soup recipe that is wonderful this time of year! I love homemade vegetable beef soup but I found a new recipe this spring that will be a great winter soup....Potato Leek soup! So easy to make and tastes great! What a beautiful card! My favourite would have to be turkey soup, my grandmother and aunt have a delicious recipe! I have two favorite fall soups: minestrone and butternut squash!! Thanks for the chance to win!! Thanks for the recipe to your Joy card! I'll be making a few of those to give out this Christmas :-) Love the new Girl's Makeup Party Cartridge! *Very* cute. I have 2 favourite soups: creamy potato chedder bacon soup and italian wedding. Thanks so much for the chance to win -- very much appreciated. What a beautiful card! I love the colors. My fav soup is Chili... I hope that's concidered soup! :) Thanks for the fun giveaway. Great card and lovely papers. Umm I don't really have a favourite as the only soup I eat if at all is Minestrone. Thanks for the chance to win. What a great card. The more I see it the more I really want this cartridge. 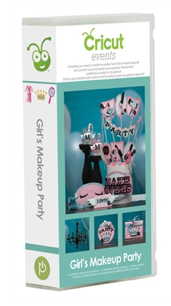 Would love to win the make-up party one...what a fun party that would be for my granddaughter & her friends. Being a transplant to New Mexico, my favorite soup is now green chili stew...the most amazing flavor I have ever had. My favorite is chicken tortilla soup. OK, it's not really a "fall" soup, but I try to eat it the first chance I get after the long, hot summer! Fabulous card, and I love your paper choice! I love that card... and I love curried squash soup from my old moosewood cookbook. Yummy and warms the tummy. I love soup - and my favorite is chicken wild rice. I can hardly get enough of that stuff! Thanks for the chance to win. Your card is beautiful and what a wonderful giveaway! Joy just love the the "Joy" card such a pretty card with an old time feel to to it. My favorite soup is vegetable beef hmmmmmm all this talk of soup is making me hungry!!!!! Thanks for the chance to win! My favorite fall soup is homemade veggie soup or chili with sour cream,fritoes,and sherred cheese.Yummy, iam making myself hungry for it. What a bright colorful card. My favorite soup is Butternut Squash soup. MMMMM good. So many to choose from.....too easy tortellini on the stovetop. If it's in the crockpot it's either taco or chicken tortilla. Yum!! Chicken tortilla is what we eat alot of around our house. I love your card! Absolutely great! I love split pea soup made with a big ham bone! Don't throw out those ham bones! Great looking card! Thanks again for another beautiful Christmas card. I look forward to your posts because you always have such wonderful designs. Thank you! Love the card! So colorful and cheerful! Favorite soups - Tomato Bisque and Vegetable Beef that I make. Can't wait for cooler weather here for more soups!!! I have never had taco soup. Cannot wait till you post the recipe. My fav soup is cream of broccoli. Beautiful card! My favorite soups to make are Chicken Rice or Vegetable Beef. Great way to use up the left over vegetables. Love the card! So festive!!! My favorite go to soup in the fall is Cheesy Potatoe Soup! I love it!!! already a follower and my favorite soup is homemade potatoe and ham. my recipe isn't good for those on a diet but you can't eat just one bowl. then add a slice of homemade bread, warm from the oven, drizzled butter and voila! hmmm, might not be able to wait til winter now. I would love to win this cart to use for my two girly granddaughters!! Thanks for the chance!! My favorite fall soup is beef barley!! another great card joy. tfs. favorite fall soup is split pea. yum. My favourite soup is onion soup. I remember my grandmother standing around the stove mumbling about what what missing or what could be added to make the soup perfect. she would always ask me what I thought was missing and of course me being so young didnt know what to say but rather just pointed to some random seasoning in the kitchen. sadly grandma is gone, but on a crisp autumn night especially when Im all alone, I make some onion soup and pretend that Im six again and that I have the secret ingredient my gram is waiting for. potato cheese, split pea, fall vegetable, I love soup! My Favorite Fall Soup is a Butternut squash soup! I have been a follower of your blog for a long time... I totally enjoy all the wonderful inspriation you provide us with all the time! My favorite soup is Italian wedding soup with warm fresh bread. I make a awesome Minestrone soup. I am really ready for soup weather. Love your card, and this cart. TFS! The soup we eat the most in winter is Chilli. Though I just made our our other favorite homemade vegetable soup last week. I love how many meals you can get out of soup. My favorite soup in the fall is Potato Bacon. Yum! Love the card and love the cartridge. Thanks for the chance to win! I absolutely love all kinds of soup, especially White Chicken Chili. It is really fun, reading the soups that everyone likes. My favorite is homemade chicken noodle soup, it's the best! Great job with the card, love colors. Can't beat a bowl of French Onion soup when it gets cold. Ummmm... cheesy goodness heaven. FRENCH ONION. also love the cards shown today. Soooooo cute. Love the ideas. Tomorrow is my anniversary and I copied a card I saw here for my hubby! thanks. My favorite is Taco Soup.